Hidden Valley Highlands Ski Club, (click and watch the video, it's a good one!) just 15 minutes away from Bondi Village, has some of the best hills in the province -- short line ups, a friendly atmosphere, a huge variety of skill levels, a terrain park and some of the best instructors you'll ever find for all ages. The home hill of Gold Medallist Slope Style skier Dara Howell, Hidden Valley proves that you don't have to be a massive mountain to deliver a mountain of fun. We've got discount vouchers for our guests, that will get 10% off all lift and lessons. Whether you are just starting in the sport, or whether you are a whiz at shredding the gnarr, there is just a ton of fun to be had at this place. 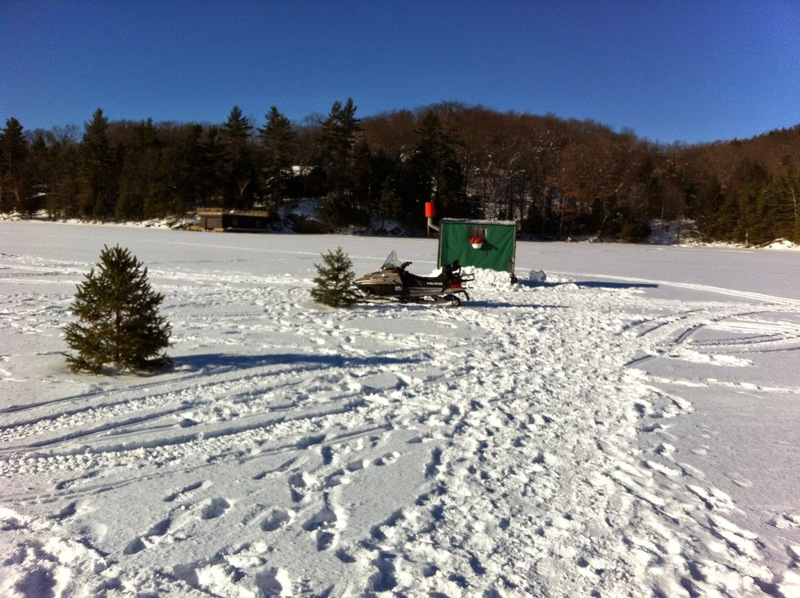 Great conditions are provided by a tireless crew, state of the art groomers and snow guns, and our great North Muskoka climate. One Eagle, Two Eagle, Wow! She was working in her kitchen, across the bay from Lumina and glanced outside. Whoa... visitors!!!!! What great photos Rebecca! The eagles have been spotted overflying Bondi as well (no surprise, since we live next door) They are a great incentive to not only get out of doors, but to grab your camera, and keep your eyes open. 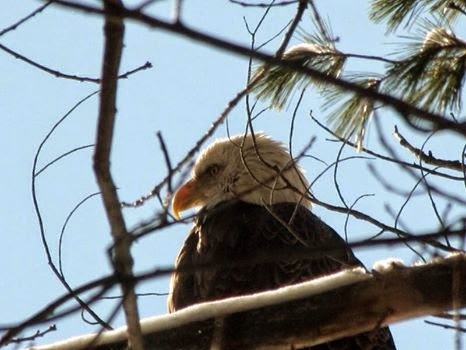 Bird watchers get a big thrill out of a visit from these majestic eagles. No wonder! There are several providers near Bondi Village who will be happy to see you go to the dogs. And truly, there is no feeling like it. 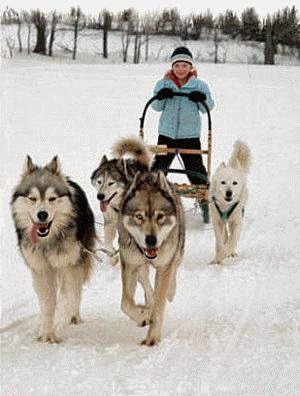 You don't have to be racing -- there is magic in gliding through a winter landscape with nothing but the hiss of the runners and the panting of the dogs. And, if you have been a feeling down, the sight of these dogs' excitement and sheer joy to be out there doing their job, will lift any spirits. 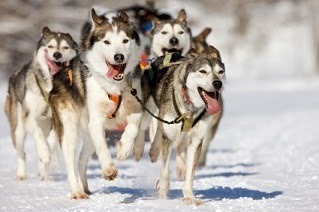 Whether you want to go for a short trip of a few hours, an overnight adventure in the Park, or you just want to come and be part of the excitement of the Kearney Dog Sled Races (coming up on Feb. 7th and 8th -- just a short drive from us at Bondi -- spend a day skiing our trails and a day Going to the Dogs -- you'll feel the better for it -- there is truly something about Sled Dogs, a special winter magic. 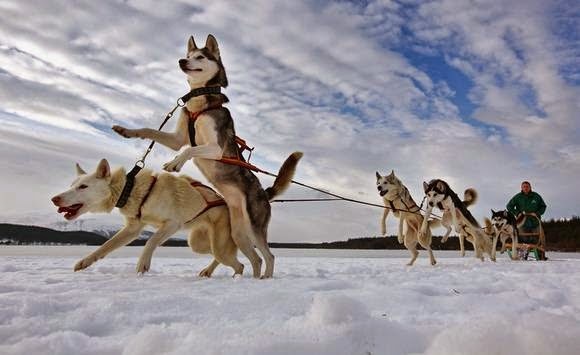 If it's a true adventure experience you are after, Dog Sledding should be on your list. That also means tons of activities. 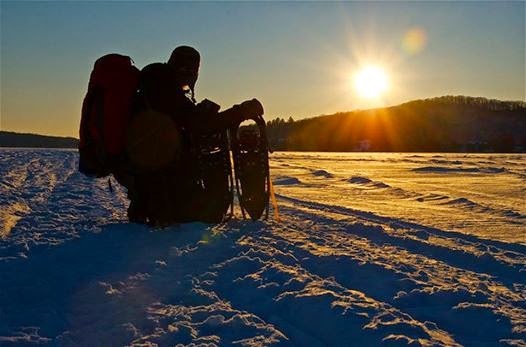 Not the least of which is Algonquin Park's Winter in the Wild Festival. If you have never been to this, well, buckle up -- it's a fabulous day of both outdoor and indoor activities for all ages, accompanied by the outstanding Naturalist Staff of our iconic Park. Family Day in Algonquin. You have to be here! Some winter days simply call for you to come outside. Who could resist? Not the fisher-folk of the BMD and their friends! Or (along with Megan and Courtenay) the inside of the heated hut, with something warm to drink close to hand, is more your pleasure. There is a well-worn track between the huts, which they follow for gathering at lunch-time. 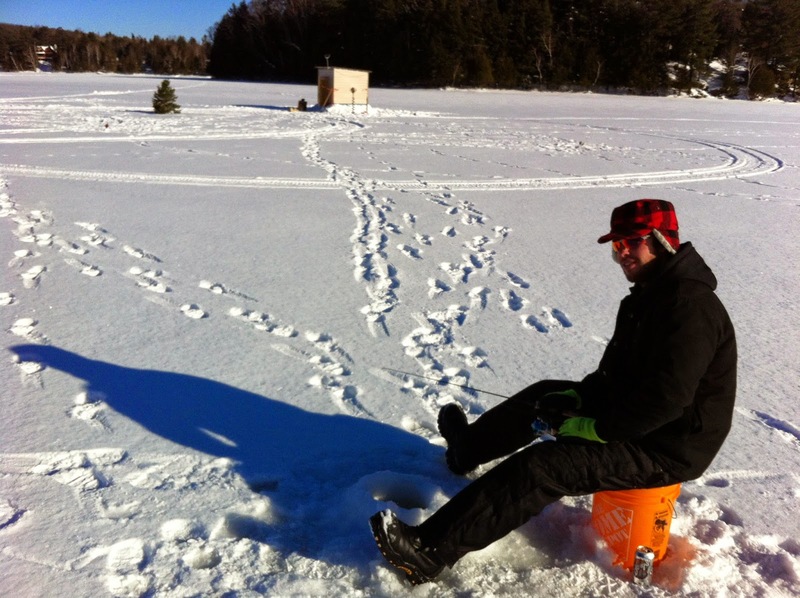 Our ski and snowshoe trails -- and toboggan hill -- have been busy this past month. We have been blessed to be hosts to several groups of Outdoor Enthusiasts -- we are a great base for groups like this. Photo Clubs, Ski, Nature, Seniors, Family Gatherings... we are delighted to welcome them all. of room for even bigger groups! Our toboggan hill has also been getting a good workout. Whether heading out for a day on the trails, or coming home for something delicious to eat, you are always in great company. Never a good sign, really, when the BMD are clustered around a piece of machinery which is all taken apart, their phones to their ears and a look of concern on faces. Taffy reports that while there was a short in the engine, there's nothing at all wrong with that front ski. Trails are all open, and in great shape. Our skiers never noticed that the groomer was in pieces! Winter is wonderful for letting you find out who the neighbours are, and what they are up to. We very rarely see rabbits, for instance, but every morning now there are a cluster of rabbit tracks around my cottage. Up in the Hidden Lake Bog, there is a snowshoe hare, with feet the size of snowshoes! We haven't seen him, either, but we know where he is because he leaves tracks. Out for a walk a few days ago, Sharon and Taffy and I headed up Brian's Ridge Road. Apparently we weren't the first to enjoy that hike -- the road sported the tracks of a very small deer, and a pair of wolves. Taffy was most interested. So were we, in fact. The deer track wasn't nearly as fresh as the wolf spoor though! I find it fascinating to look for tracks - sometimes we'll find where an owl's wing has swept into a snowbank, or the delicate all-in-a-row circles left by a fox. Or the tromp of the turkeys. You just need to spend a few moments and actually look at what is around you. You'd be amazed. This doe was right outside my cottage door yesterday. she looks to be in excellent shape for this time of year -- not like our buck, who is very thin and looks like he had a rough autumn season. 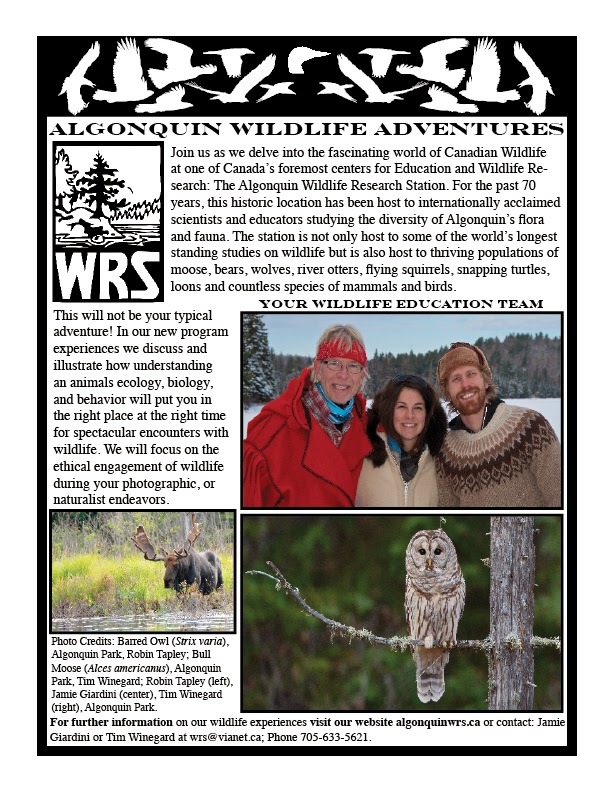 There's something new and exciting at the Algonquin Wildlife Research Centre. Our cousin Robin Tapley along with Tim Winegard and Jaimie Giardini will be offering outstanding educational wilderness experiences, starting in March. Most people never get into the section of the Park where the Wildlife Research Centre operates, and those that do go with guides. This is true wilderness, and these three are the best in the business when it comes to walking (canoeing, snowshoeing) you through it. Your Wildlife Adventure in the heart of Algonquin Park begins on March Break. We will be featuring a series of unique program adventures that focuses on the ethical engagement of wildlife. You will join our Naturalist Education Team on one of our two night adventures where we will uncover and explore the back country of Algonquin Park. From our base (the Wildlife Research Station) each day unfolds as we prepare to explore the natural behaviors of wildlife that make their home in Algonquin. You will experience and learn how to explore your natural surroundings by putting together your five senses. For further information please contact Station Manager Tim Winegard at 1 705 633 5621. So go ahead, make the call. And remember, if you're taking part in a day experience, we are a fantastic near-by base for you to stay! Here is a better look at our northern flying squirrel, who is currently dropping by in the evenings to check out what's on the menu at the bird feeder. Along with the summer chipmunks, these little guys are so darned cute that they get a pass in the 'how dare you steal all the birdseed' department. Light as can be, they don't actually fly, but extend their arms and legs to stretch out the loose membrance between and glide -- considerable distances. They climb like, well, like squirrels, dashing up almost any surface to get the height and then simply leap into space, arms spread. They are without doubt one of the most beautiful creatures out there. It is, as they like to say, a 'dry cold'. At least when the thermometer plummets, it is too cold to snow, and we get crystal clear days. Absolutely breath-taking -- in both senses of the word. It's a good time to put on a scarf! In fact, if you are properly layered up, it's a good time to be out of doors and active, too. Ski trails and snowshoe trails that wind through the woods are protected from any windchill, and that warms life up considerably. But it is no time for standing about. 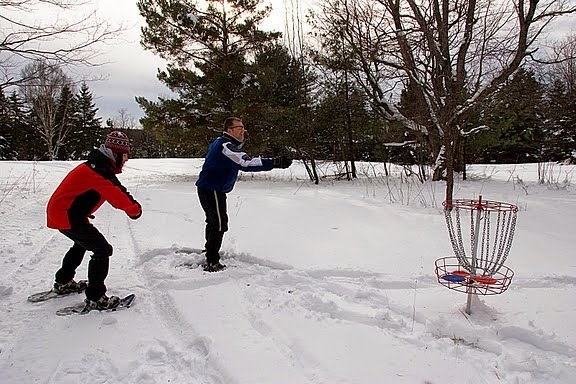 Winter is not a spectator sport -- you need to get active! So, stealing a line from the Columbia clothing advertising, get the right winter gear, and then "Get out and Stay Out." At least for an hour or so. Then you can feel free to take part in one of the most favourite of all winter sports: Coming back inside for a drink by the fire! We had visitors. When I went out with Taffy yesterday, we found several deer beds all snugged in very close to my house (in background, left photo). This one was right in front of Clover cottage. In front of my place, there were several, and a large disturbed area where the deer had dug up the snow. And this is looking back at it from near the lake. And this was right by Clover's door, beside the trail we have leading onto the lake. Deer dig a bed in the snow, and hunker down. With their thick coats, and hollow-shafted hair, they are so well insulated that snow falling on them will not melt. They must feel comfortable around us, to nest in so close. We see them on the lawn almost daily, but we don't always find them having a nap just outside the door! Get your Art On. Ice. Snow. Melt. Thaw. What a wonderful surprise arrived in my inbox this week. 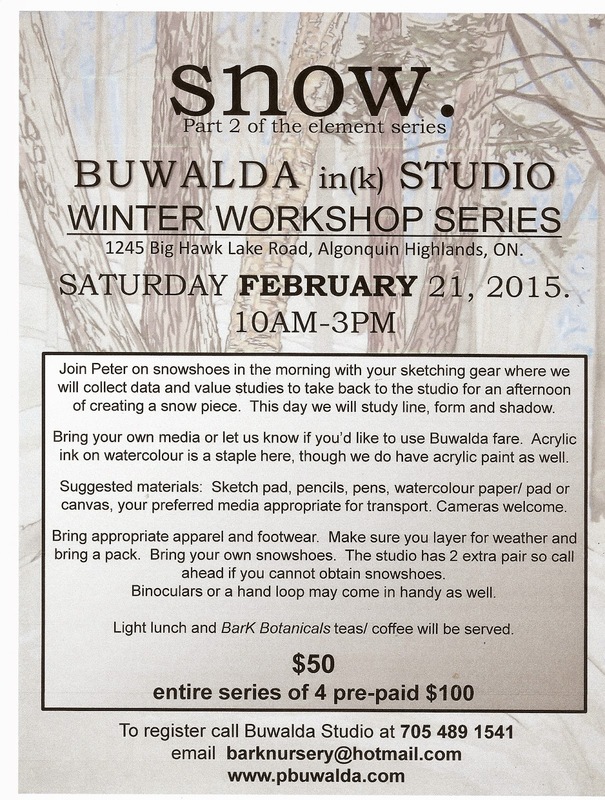 Peter Buwalda, of Buwalda Studio is offering a series of winter workshops. These will help you release your inner artist. Or refresh it. Or kick start it... Or simply enhance it. Whatever. 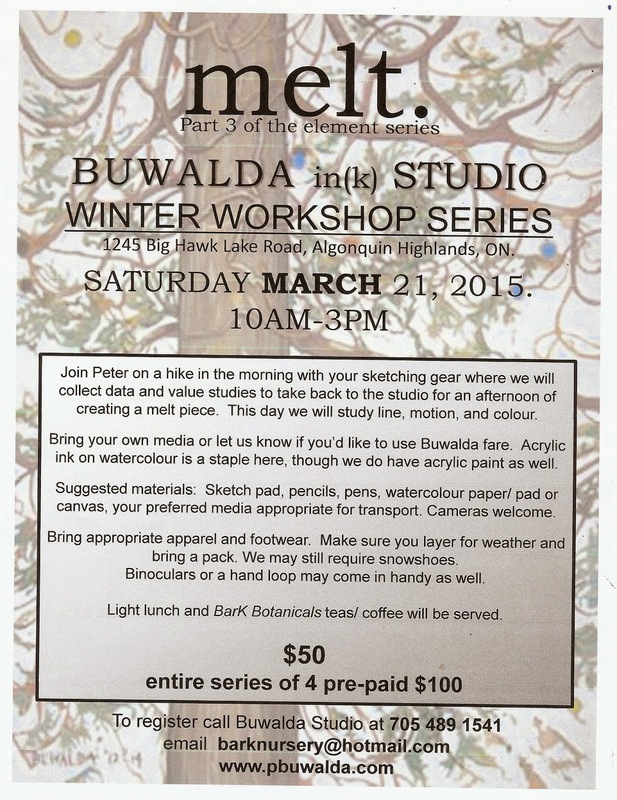 If you have ever longed to dabble with art, or if you are an experienced and accomplished artist, here's a wonderful wonderful way to spend a day -- snowshoeing the winter woods in the morning with Peter and your camera and sketch pad, then back into the cozy indoors and a cuppa... and a light lunch. 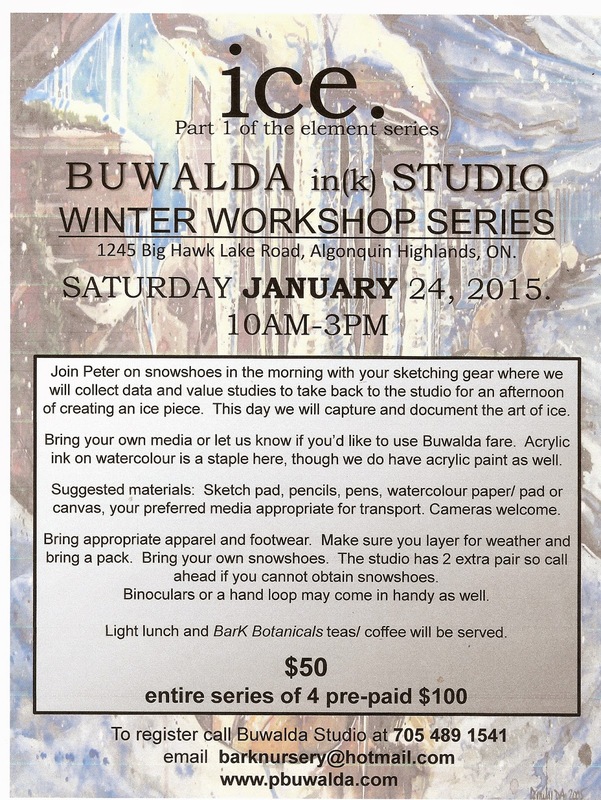 The first workshop focuses on the art of ice. The second focuses on line, form and shadow. And the fourth, for which hopefully snowshoes will not be required, but waterproof boots might be advised, looks at mark-making. 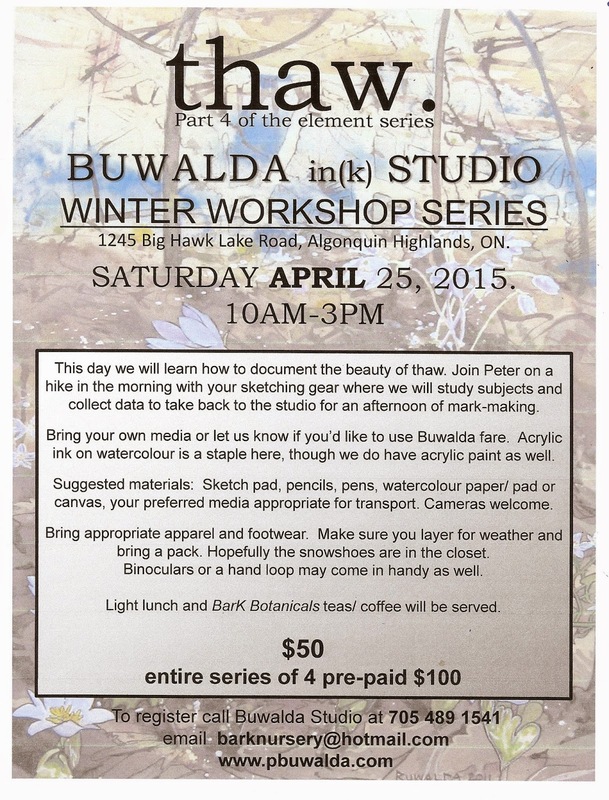 Bring your own favoured materials, or Buwalda Studio can supply you. While the first one is set to roll out January 24th, we're posting all four of the courses here for you. It is a steal of a deal, at $50 each of all four for just $100.00. This would incorporate beautifully into a winter getaway weekend, a Gals' Getaway, for example, where you'd have a day on our ski trails, two great evenings together by our fireplace, and a day out with Peter in the studio. 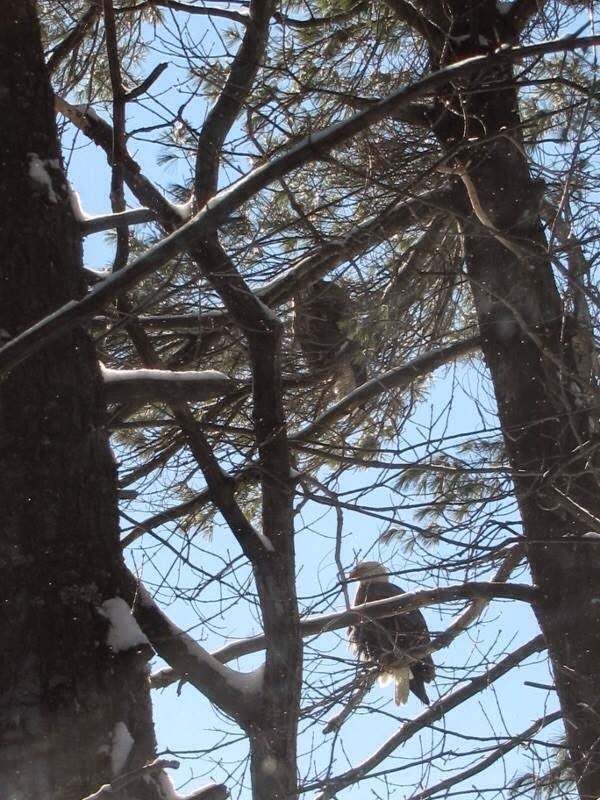 Dave snapped these pics for me while he was out grooming our ski trails this week. There is something absolutely magical about immersing oneself into the silence of a winter woods. Not that it IS silent -- there are the calls of the birds, for one thing. But there you are, just you, uncrowded, alone... Not that you ARE alone... if you look at the tracks, you'll see that in this part of the trail system near Hidden Lake in a black spruce bog, we share the planet with the world's largest snowshoe hare. At least, looking at his huge pawprints, one might think so. And squirrels. And rabbits. Foxes. Sometimes the sweep in the snow of an owl's wing. Deer. Wolf tracks. Just because one doesn't see, or hear, does not mean it is not there. Still, it is good to simply pause, listen to the silence, and let your soul catch up. Our @20 km of trails are uncrowded, but we are far from the only place up here you can slide your nordic skis. Algonquin Park has some trails. So do the Friends of the Frost at the Leslie Frost Centre. And there is always Arrowhead Park, with a world class network of both recreational and racing trails on offer. Who knew? This Saturday is World Snow Day. World What???? 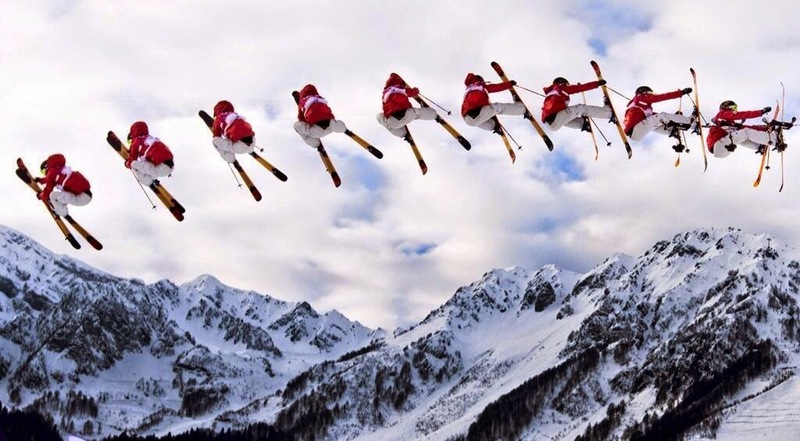 It is a global 'thing" -- the second phase of the FIS (International Ski Federation) 'Bring Children to the Snow' campaign. World Snow Day looks beyond the FIS membership to the wider snow sports community. It seeks to motivate children aged from 4-14 by encouraging all stakeholders to celebrate all things snow around the world simultaneously. In short, World Snow Day is the biggest day on snow all year. And World Snow Day is not a one-off event but is planned to be staged annually for years to come. But you don't have to be racing to be out there in the snow. 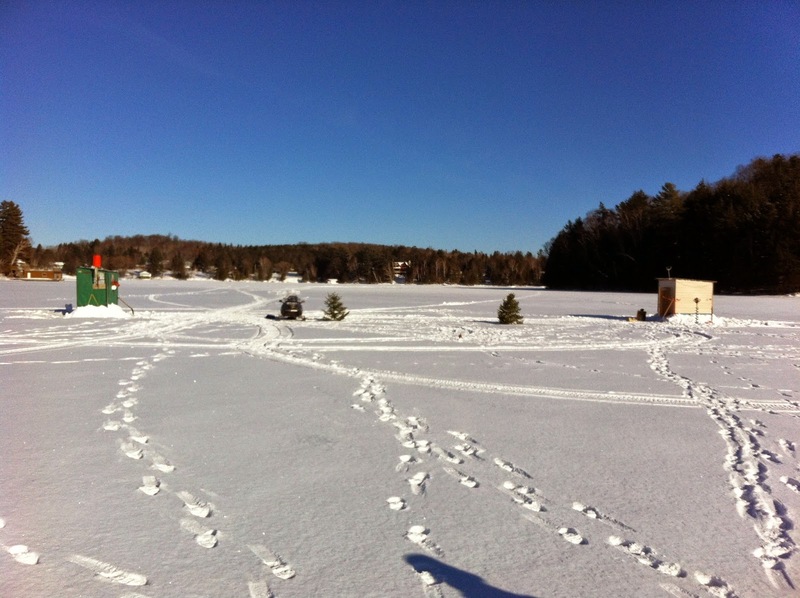 Come ski our quiet trails, with levels for all abilities and great chances to see wildlife. Or visit Hidden Valley Highlands and check out the sport of alpine skiing! If you're staying with us, we've got 10% discount vouchers. And the Valley has brilliant ski staff who will get you and your kids going downhill fast in no time. 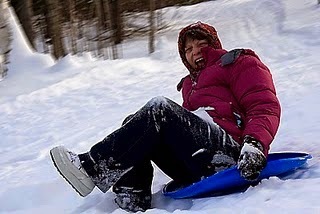 We are all about celebrating the snow, and bringing the children to the great outdoors. Kids of ALL ages, that would be. 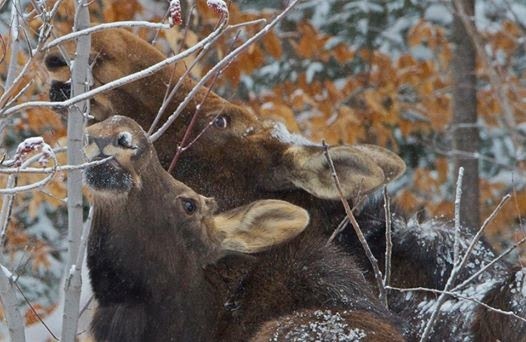 Today our cousin Robin Tapley had lunch with this mother moose and her calf in Algonquin Park. Robin, along with fellow naturalists Jamie Giardini and Tim Winegard, are about to roll out a series of workshops and experiences for you to enjoy. Based at the Algonquin Park Wildlife Research Station, they have access to a huge tract of the Park where most people never get to go. If you want to learn how to get photos like this, of creatures like these, you should stay tuned for the start of this great new venture in the Park. Information will go up on their site on January 12th... check it out. It has been snowing all week. As fast as Brian and David get the driveways cleared out and the ski trails packed in, more snow arrives. causing water to seep up from beneath and turning the surface of the ice into a soggy, slushy mess. You can't do anything with that. Be careful if you are heading out on any of the lakes, because that slush is a nasty thing. Know where the trails are packed in (so the slush can freeze down) and know where the ice is good, too! been coming for their Bondi New Year get-together for 34 years. Wow! It is a fabulous chance to get everyone together to enjoy family time. great job in this net! Taffy came with me to take pictures, and discovered (to her great glee) that they were using green tennis balls. Which seemed to be a little too inviting... Luckily, they had several, so there were no interruptions in play while I retrieved the ball from the retriever. This morning they spent up on the toboggan hill before trekking back for lunch. It makes for a full day and that is just they way they like it! The weather changes in an instant. Coming back from the arena, Meredith and Spot followed the fenceline, to make sure they were not lost in the arctic blizzard. It was really coming down out there! Squeegee snuggled up close to Blizzard, who seemed to be offering him at the very least moral support! Carry the Camera.Meet the Neighbours.